E-learning is one of the most preferred media by organizations to train employees because of its flexibility and various useful features. It can be leveraged to deliver a wide variety of subjects, including food safety training. The aim of an eLearning program is to transfer knowledge and help learners solve a problem, using the skills and knowledge gained from it. Before we see why food safety is important, let us look at statistics by CDC on foodborne diseases. As per Centers for Disease Control and Prevention data and statistics, about 48 million people (1 in 6 Americans) get sick, 128,000 are hospitalized, and 3,000 die each year, due to foodborne diseases. The above statistic emphasizes the importance of imparting food safety training to all employees working in the Food industry. Employees should be aware of the hazards that can occur if safety measures aren’t followed. You can do this by creating an online food safety course to help learners understand the safety standards; you can also teach them which safety measures are to be followed while handling or dealing with food. 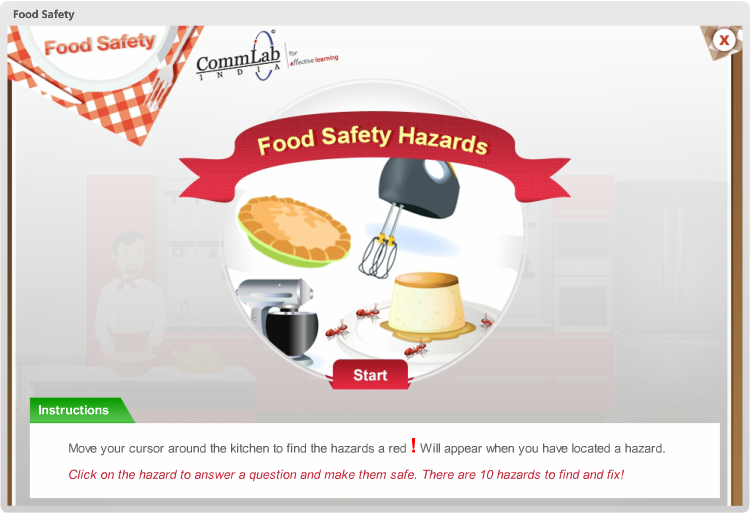 Let us now look at an example Food Safety course, developed in Articulate Storyline. 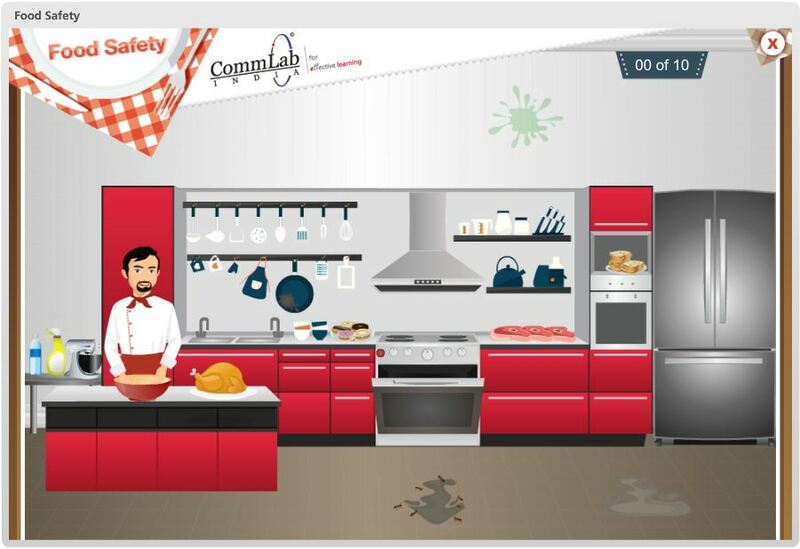 This gamified course talks about the safety hazards that can occur in a kitchen. 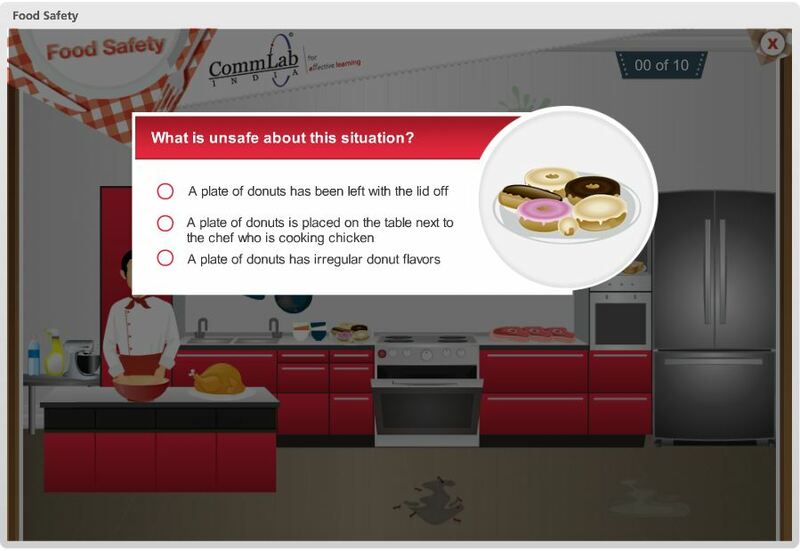 In this eLearning course, we have used a scenario-based approach. We have created an environment where the learner can explore and examine a particular situation, and we offer solutions to the problem or hazard, based on the findings. This makes learners aware of the hazards and the measures to be followed. As you can see in the screenshot given below, there are 10 potential hazards in the kitchen and the learner has to identify each unsafe item. Once the learner spots a hazard, he has to identify what is wrong and what can be done to avoid the hazard. 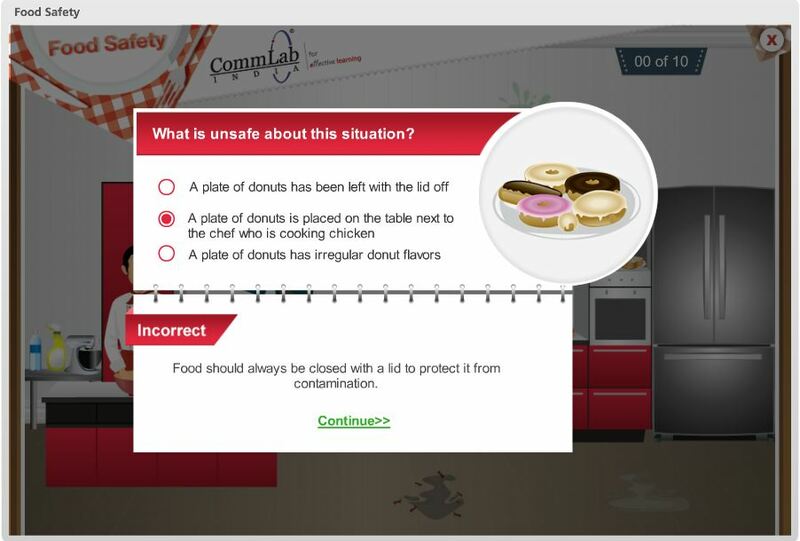 As seen in the screenshot shown below, the first hazard identified is a plate of donuts. Let’s see what’s wrong with it, by answering a question. The learner is given feedback, based on his response. If he fails to answer the question, he is given the option to ‘Try Again’. Finally, when he answers correctly, the safety measure to be followed is shown; here the safety measure is that the plate of donuts should always be covered. This lets the donuts stay fresh and avoid being contaminated. 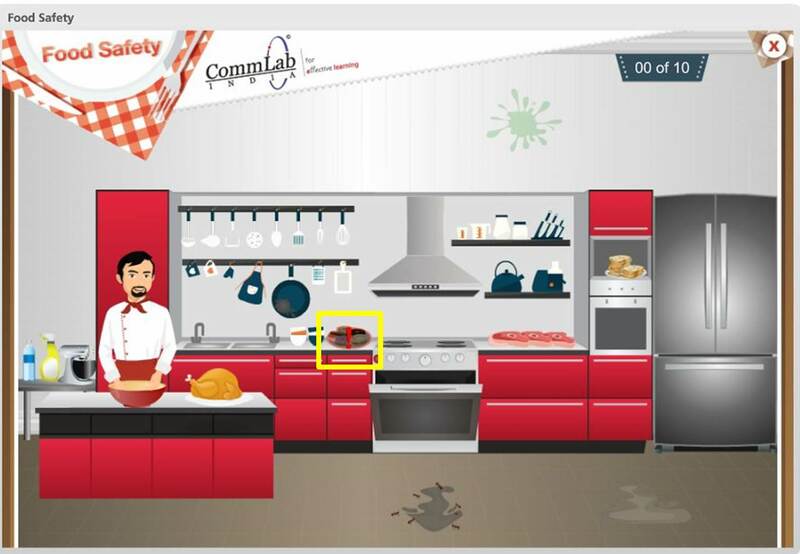 Similar interactive elements were developed to help learners identify all 10 hazards in the kitchen. Doing so, we made the learner aware of the food safety hazards which can be avoided while handling food. Start your food safety eLearning course with a strategy similar to this and make it standout among boring page-turner courses. Hope you found this blog informative! Do share your views.